Tactical22.net was an invaluable resource when I began researching AR rimfire plinkers therefore I’m very pleased to share my review with their forum members. My interest in purchasing an AR plinker spiked (no pun intended) during the 2009 SHOT show held in Orlando last January. It was exciting to see new offering by SIG and other manufacturers. I was ready to place my SIG order early on, but after several months and no clear release date, I decided to simply add my name to a waiting list. During the interim I’d become less patient and begun looking at alternative AR rimfire rifles that were currently available in the marketplace. Tactical Solution’s and Spike’s build excellent dedicated AR rimfire rifles and uppers, but I didn’t want to invest that much money into a plinker, nor did the conversion kits interest me. The GSG5 and GSG AK-47 are pretty neat, but for some reason they don’t appeal to me enough to purchase one. A process of elimination narrowed down my remaining choices to the Colt line (I like the OPS) and S&W M&P. I’ve read enthusiastic reviews about both and they seem to be an immediate hit with shooters who have purchased them. I had the opportunity to handle both manufacturers models at a local gun shop however they’re quiet pricey in our area. Based upon my inspection, reviews and owner feedback in several online forums, I decided the M&P was the most suitable for my plinking needs, and well under my budget, even after accessorizing. My Colt and S&W comparison information (PDF file) can be viewed here. My price comparisons suggest that it’s a good deal less expensive ($150-$175) than the Colt, weighs less, has more functional AR-like controls, the trigger group can be changed if desired, has a removable bolt assembly (for easy cleaning), and is manufactured in the USA by a company that stands behind its product. So, about two weeks ago I contacted my dealer, Donna at DB Flanagan’s Gun Shop, and requested that she give my spot on the SIG 522 waiting list to a deserving soul. I placed an order for the M&P15-22, which she located very quickly for me. If you’re a SIG fan you may know Donna (MississippiGal) from over at the SIG forum. She’s terrific to work with and very competitive with pricing on many brands. The M&P arrived last week. When you pick it up it feels solid, but it’s also relatively light given the polymer upper and lower receiver, and quad rail. The quad rail and buffer tube for the adjustable stock are not removable. It’s my understanding that the stock can be replaced with any mil-spec variant. I’ve also read that future variations of the M&P may include a threaded barrel. If you decide that you want to thread this one, the removal procedure is different then you would encounter on a standard AR. There’s more information here. As with all new arms, I prefer to field strip and clean them prior to shooting. 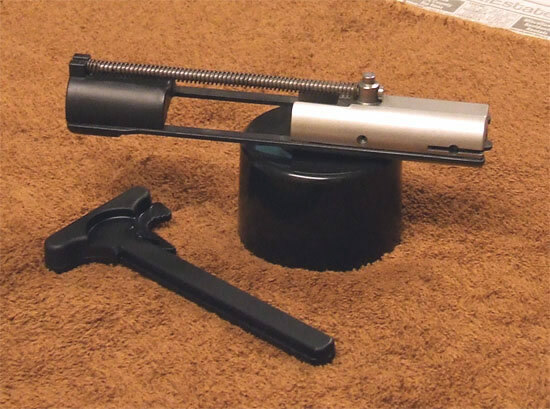 If you own an AR you’re already familiar with the simple breakdown procedure. The only difference in the process with the M&P occurs at the very end of the sequence. With a standard AR you slip the bolt carrier group and charging handle out of the receiver. With the M&P15-22, you slip the bolt ASSEMBLY and charging handle out of the receiver. The functional charging handle appears to be polymer with a metal latch, and is shorter than the handle found on a standard AR. It’s very easy to clean the bolt assembly once it’s removed from the upper receiver. And with the assembly removed, like a standard AR, the barrel is much easier to access and clean from the chamber end. I use an Otis Cleaning System with flexible cable on almost all of my pistols and rifles. If you prefer to use something like a boresnake or traditional cleaning equipment, they should work fine too. I decided to install a few parts I had on hand from an old AR build and add a few new accessories I ordered while waiting on the rifle to arrive. If you plan to replace the OE grip you’ll need a long-reach 3/16” Allen wrench to remove the mounting bolt inside the grip. I utilized a ball-end 3/16” long-reach Allen wrench that came with my Knoxx Spec Op Stock for my Remington 870 which worked quite well. I decided to replace the OE pistol grip with an Ergo Sure Grip I had on hand as shown in the photos. Once installed, I discovered that the upper portion of the grip (at web of hand when holding grip) does not snug up tightly to the lower receiver like it normally would on a standard AR15. Instead, there’s a small gap between the receiver and grip. It’s not too noticeable unless you know it’s there, nor is it a hindrance when handling or shooting the rifle. The gap does not affect the installation in any other way; the grip is held firmly in place once installed. It is my understanding that the gap is also an issue with the Magpul MOE grip. This suggests there may be some slight differences in the M&P15-22 and standard M&P15 design. If you wish to simply avoid the issue with the gap use a grip that does not have a back strap, such as a Hogue or Tango Down Battle grip. 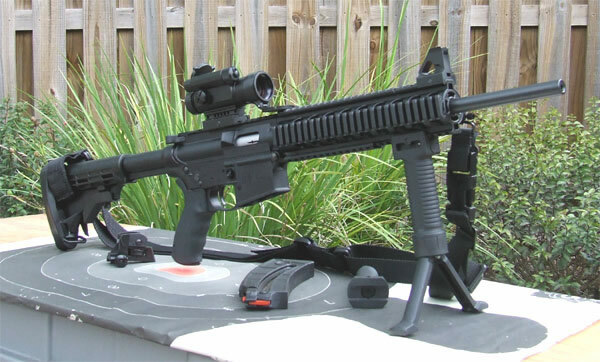 The Primary Arms Red Dot M4 is popular with members of the AR forum. The red dot works well and is under $100 delivered. 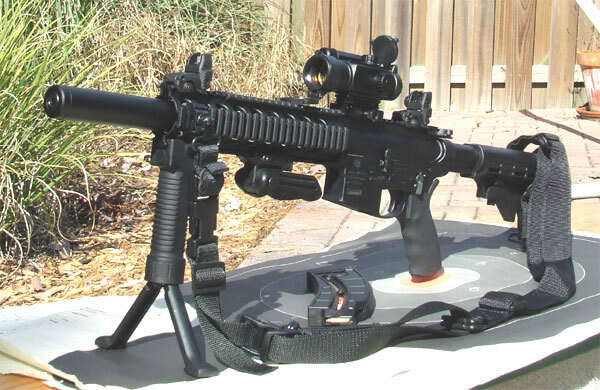 An AR rail mount is included, it co-witnesses with the irons, runs on one AA battery, offers 4 reticules, including a 2MOA dot. The company provides excellent customer service. I wish the quality of the photos were better, but unfortunately I don’t have the best camera and it rained and or was mostly overcast and cloudy all weekend. My primary goal on this first outing was to test the reliability of the rifle with different types of ammunition and to sight-in the irons and red dot. Given the limited time I had to shoot this weekend, determining accuracy was only a secondary concern. There were no compatibility issues with the quad rails and accessories (red dot, grip bi-pod, rail covers and VFG) I mounted. Although the rails are polymer they appear to be sturdy. The backstop is approximately 60’ on this range. Even at that distance, with my older eyes, precision shooting can be challenging with open sights or a red dot. Of course, this isn’t a target rifle, but we all strive to shoot the best we can. When I pulled the trigger on the M&P15-22 the first few times it was an odd feeling. I felt somewhat bewildered and disappointed. If you own or have ever shot an AR15 you’ll understand what I mean. With the real deal you have the expectation and satisfaction of some healthy pushback and recoil. That’s not the case with the M&P15-22; there is minimal pushback, recoil and report. The good news is that you won’t feel bad for very long. As you continue shooting your disappointment will turn into glee when you realize how much fun you’re having and how little money you’re spending on ammo. You’ll still be standing at the firing line long after the shooter next to you runs out of centerfire ammunition and heads home. The trigger pull is perfectly adequate; no better or worse than what you would expect to find in a standard USGI equipped mil-spec trigger group, however if desired, the fire control group can be upgraded. After sight-in, I shot offhand for a little while with open sights. Later in the session I mounted the red dot and grip bi-pod (shown in photo) and shot off of a bench, standing up. Although the magazine is long it did not present a problem shooting off the bench in this manner. Rapid fire is not allowed at this range so I fired one round approximately each second or two until I emptied the magazine. Interestingly, during the session I inadvertently bump-fired the rifle two or three times with 2-3 round bursts. That was kind of cool and no one seemed to notice or at least no one said anything. Cumulatively, I expended approximately six hundred rounds and experienced zero issues with the rifle. The proprietary 25-round polymer magazine appears durable and of good quality. It functioned perfectly as long as you followed the loading (one round at a time) instructions outlined in the manual. Once you’ve loaded it a few times the process goes quickly, but I must admit, after reloading this many times during one session my thumb and index finger became a little sore while holding down the load assist button exposed on each side of the magazine follower. The magazine bolt hold back feature worked fine. Each time the magazine expended the last round the bolt held in the open position. Spare magazines were not available when I purchased my M&P, but my dealer backordered two for me for $46, including shipping. At about $20 each they’re very reasonably priced and also available through Smith & Wesson. With the exception of Remington Gold Box all of the ammunition functioned without issue. I had at least one round of Remington GB in each of 4 magazine reloads that failed to fire and had to be manually ejected. I wasn’t surprised given my past experience with it and its mediocre performance. The target below has five 7.5” outer rings. Each outer ring has a number eight (black) 3” inner ring. The lower rings were used to sight in the red dot and open sights. 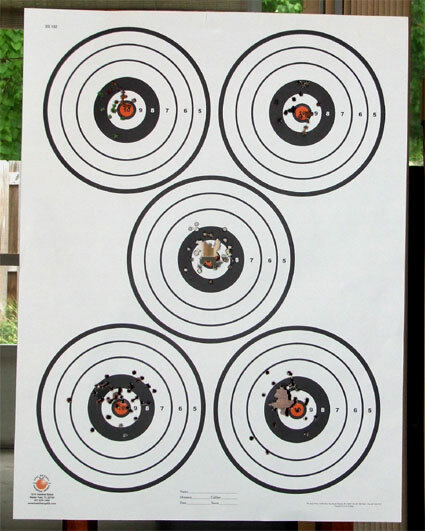 This is one of two targets that I used during the range session. I did not clean the rifle during the range session however when I did get to it later in the day not surprisingly it was very dirty. I also decided to disassemble and clean the magazine which was quite simple with the instructions outlined in the manual. 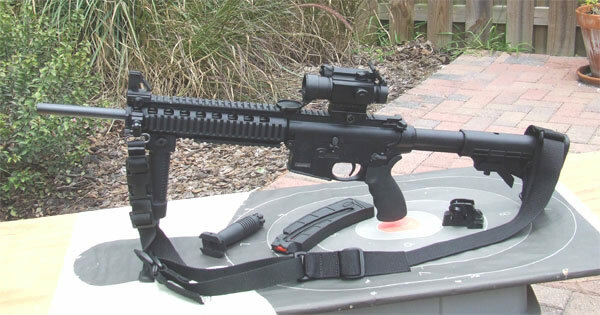 Barrel Twist: 1 in 16"
Since my initial M&P 15-22 review last August I’ve shot the rifle on several occasions primarily using Wa-Mart Federal 36 grain CPHP (550 VP). I have made it a point to stay away from the Remington Gold Box ammunition which has been problematic with my other rimfire firearms. First, field strip and thoroughly clean/lube the rifle, and clean the magazines. Second, unless you enjoy firearm repair, stay away from poorly manufactured rimfire ammunition. You may not encounter an immediate issue, but eventually the law of averages will catch up with you. After which, most of the issues I’ve read about have generally been related to improper magazine loading or misaligned and or damaged ejectors. It’s not rocket science folks; to correctly load the magazine one must simply follow the instructions in the owner manual. I know; it’s a guy thing. We don’t read manuals until after we encounter a problem. That may be fine for a lot of stuff in life, but not for responsible firearm ownership. Please, read the manual first. For the most part stovepiping and extraction issues have been blamed on misaligned and or damaged ejectors. You may have a choice of repair options here. If you’re not sure what’s causing the issue and or do not have experience with firearm repair the best course of action is to send it back the manufacturer. S&W does a good job here. They pay shipping both ways, turnaround is about two weeks and most owners report that S&W has been returning the rifles with one or two free magazines for your inconvenience. Option two is a DIY repair and assumes that you’re experienced and know what you’re doing. You can review the YouTube videos below and attempt a misaligned ejector repair. Since I usually use the Primary Arms M4 red dot when I shoot I decided to replace the OE sights with a set of MagPul’s inexpensive, polymer foldable sights The MagPul sights flip up when needed and co-witness efficiently with the red dot. They also make it possible to easily slip a silicone treated gun sock on the rifle prior to storage, if you’re so inclined. The UTG appears to be an inexpensive knock off of the more expensive CAA AR-15 3-Position Folding Grip. It’s not as robust as the CAA grip, but perfectly fine for the M&P 15-22. This barrel shroud is designed specifically for the Smith & Wesson M&P15-22 by MP-1522.com. It’s protected with a black hard coat anodized Type III Mil-Spec finish for a long service life. I purchased the long unthreaded version which extends into the OE quad rail approximately 5/8”. Installation is very straight forward. Remove the OE quad rail end cap, slip the barrel shroud over and down the barrel and tighten the set screw. I’m pleased with the quality of the shroud and it looks very nice on the naked barrel. It adds an additional 8 ounces to the rifle.